The parliament of Georgia has started discussions over the draft law on the protection of the security of private life and on illegal surveillance. The parliamentary majority claims that the draft reflects European Union conventions, while the minority stresses that the draft grants too much power to enforcement bodies. The development of the draft began nearly one year ago. NGOs intensively demanded the adoption of the law against illegal eavesdropping, especially when thousands of recordings illegally typed under the previous government were destroyed. The NGOs, former officials, and members of the United National Movement (UNM) claim that the Interior Ministry still actively eavesdrops on people. NGOs even renewed the campaign It Affects You, stressing that the Ministry was creating obstacles for the adoption of the law. The ruling team denies speculations, admitting that the appropriate drafting required time. The coalition member Shalva Shavgulidze said that the draft presented to parliament fully reflects EU conventions and specifies situations and circumstances when eavesdropping is permitted. Minority member Levan Bezhashvili states that eavesdropping, if it is required and allowed by the court, should be carried out by mobile operators and not directly by the MIA. “The Ministry should be deprived of this power. However, Parliament, through the draft fails to make the step. The Ministry is against such an article in the law, as in such a case they would lose serious power,” Bezhashvili stated. Members of the movement It Affects You state that all the major points of the draft are acceptable for them but the one that is related to leaving the power in the hands of the Ministry. Prior to the parliamentary discussions, NGOs made a joint statement that reads that the efforts of all the stakeholders are important to create such a modern system of eavesdropping and surveillance in Georgia, which excludes violating the private life of persons and the publication of private information on the motives of citizen safety. According to them, the government of Georgia should take effective actions as soon as possible and should demonstrate unambiguous political will to change the incumbent faulty system of eavesdropping and surveillance. “It is important to gain public trust towards the new system, which, on the one hand, should ensure citizen safety, and on the other hand, protection against infringement of their private life,” the statement reads. 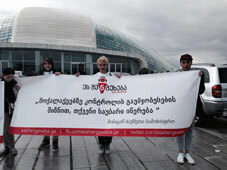 The movement’s members, which include Georgian Young Lawyers’ Association, Transparency International Georgia, Open Society Georgia Foundation, Civil Development Agency and some others, emphasize that Parliament should enact the draft law initiated one year ago and approved by international experts, as soon as possible. “The Law-Enforcement Bodies should stop resistance against the enactment of the progressive legislation and should stop misleading the citizens that the draft law represents a threat to the safety of the country. We hope that at least during the second hearing of the draft law in the Parliament, the Ministry of the Internal Affairs and the Prosecution of Georgia will name concrete Articles that in their opinion, pose such a threat. We believe that both the previous and the incumbent governments are responsible for the shortcomings existing in the eavesdropping and surveillance-related legislation and for the existing practices in the law-enforcement bodies,” the joint statement reads.